It was a tough year for money managers. All asset classes underperformed cash and most were negative for the year. Equities were a return disaster for December. Hedge funds did not do well for the year. So what will investors do? The BlackRock Institutional survey for 2019 has come out and provides some interesting choices by managers. The survey represents over $7 trillion in assets under management and and 230 institutional managers. The actually timing of the survey is not clear so I cannot say whether all of the return information for 2018 was available when the survey was conducted. 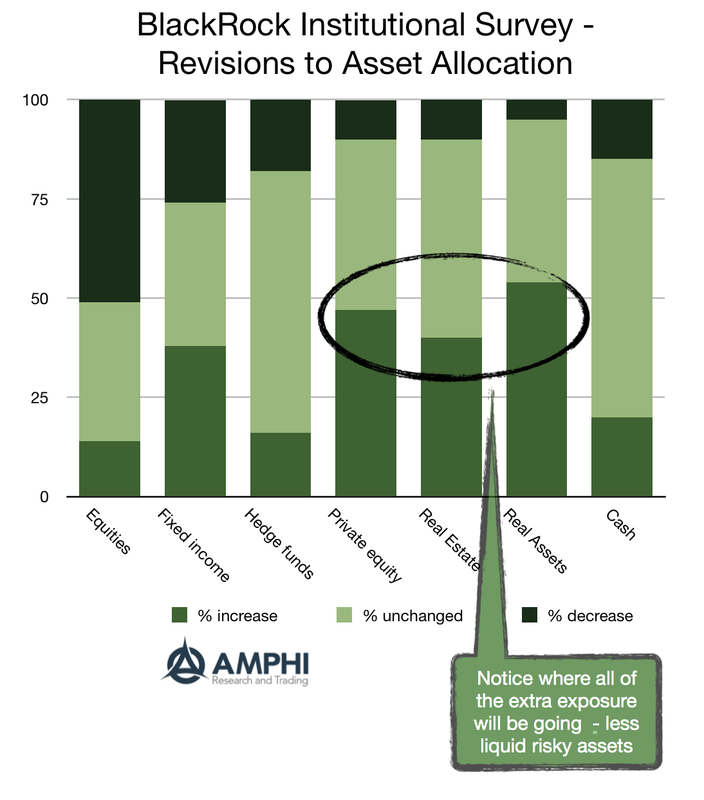 The number show a decrease in equity and increase in fixed income for 2019 with hedge funds and cash allocations staying about the same. However, private equity, real estate, and real assets all show an increase in allocations. Does it seem at all odd that after a poor performance quarter, greater talk of recession, higher volatility, and the likelihood that we are late in the financial and credit cycle, investors want to increase their exposure to less liquid investments? There was the stretch for yield when rates were low but now it seems like there is a stretch for investments that don't have to face the ugly effects of volatile pricing. How can anything go wrong with holding less liquid assets when if there is an economic slowdown, there will be increased redemptions on the part of end investors?